The wedding day is a big dream for every girl. She has lots of plans in mind for the pre-wedding shopping, her outstanding outfit, superb jewellery, Cinderella-like sandals, fabulous makeover and all other things must be perfect. In this era where everyone wants to keep pace with the new fashion trends and wants to look better than other, a bride has to look awesome and grab everyone’s attention. It is the natural desire of a girl to look better and beautiful than others and she must. After all, it’s her big day! Selection of wedding dress is something which requires a lot of search, time and effort. Get to know about Latest Crop Top Lehanga Designs for Brides 2018 in this blog! When it comes to the colour selection of bridal lehanga, red is a foremost. yes, It may be blended with other combination of hues. Other colours like maroon, orange, gold, plum, mustard yellow, ivory, silver, emerald green, blue, pink and magenta also look very attractive. Careful balance in contrasting and matching colours is actual art of designing marvellous bridal wear collection which speaks about the art of our talented designers. Designers played best with the embroidery and fancy work to bring their new magical crop top lehanga collection for brides. Embroidery, zari work, tilla work, beads and pearls, using unique motifs and cutwork on borders have recently been used in new designer lehanga collection. The latest bridal lehanga collection has brought different styles and cuts in simple lehangas. Among these are also Latest Crop Top Lehanga Designs for Brides 2018. These lehngas with cropped tops are inspired by subcontinent culture and are famous in Pakistan and other neighbouring countries alike. The exquisite embellishments and high-quality fabric have an outstanding quality of this unique bridal wear. The top on lehanga can be kept with full or half sleeves according to your personality, likes and even according to climatic conditions. You can select any fabric of your choice; it may be Satin, Chiffon, Organza, Georgette, Silk, Crepe, or Velvet. Lehanga must look cosy when paired with the top. The colour scheme of fabric and the assortments made on it are very much important in giving a final look to your attire. Using contrasting colours in top and lehanga is the best option. The top can be of deep and dark colour while lehanga can be of light colour. In another way, the top can be of light colour with dark coloured lehanga having heavy embellishment with diamondties, beads, pearls, applique, gota, dabka and zari work. Crop top lehanga styles are also varying depending on your choice. Unique cuts and little effort on your attire will make people remember it for ages. Wedding Lehngas can be of tail style or have a cut alongside. 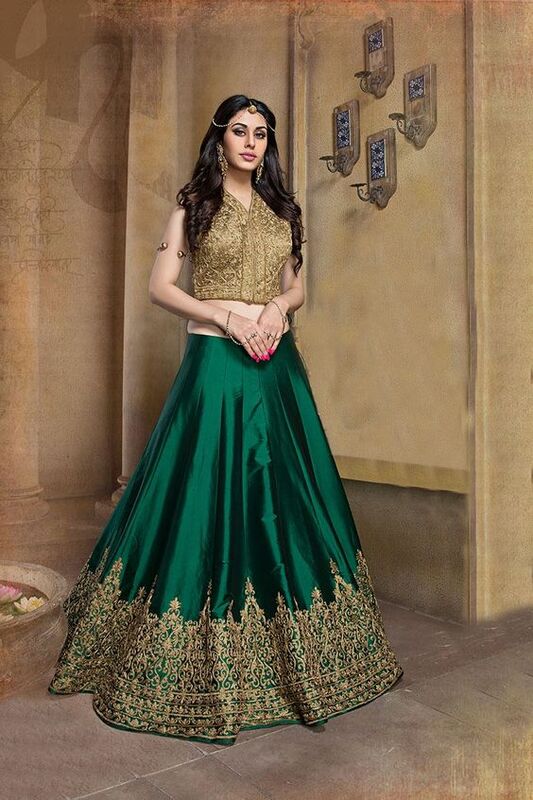 Large volume lehanga with crop top look amazing and adds glamour to the overall look of the bride. 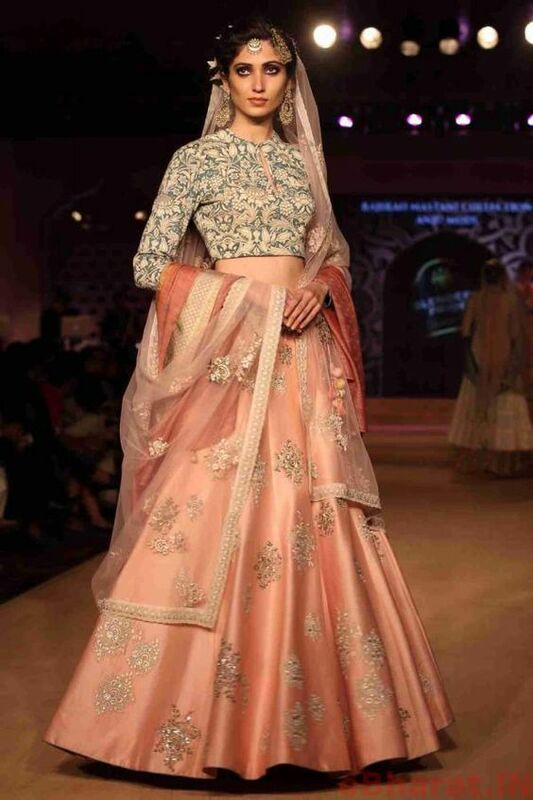 If you are going to be a bride must order large volume crop top lehanga! 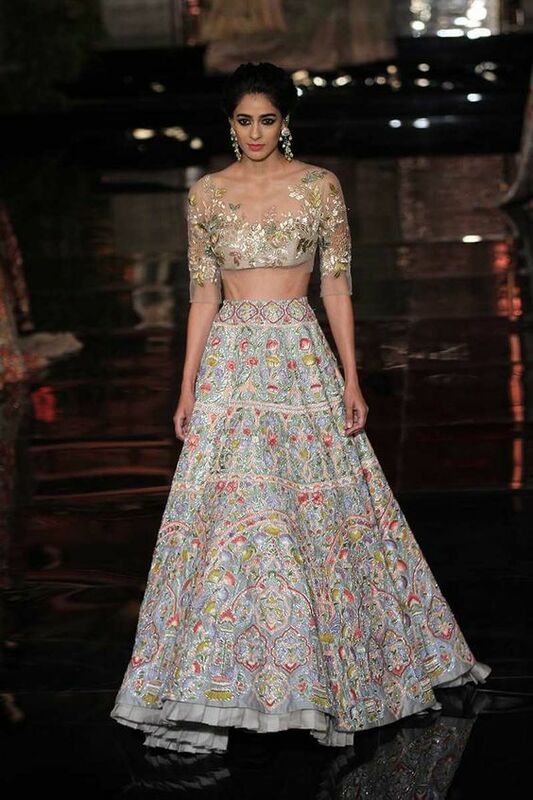 What Sort of Jewellery would fit best with Crop top Lehnga? It can be paired with long net dupatta having embroidery or bordered with contrasting strips having pearls, stone and sequence work. Using tassels with lehanga will boom the creativity of your attire. You can use fancy, tassels with gold wiring and shining beads which will add up to the overall fascination of lehanga with a crop top and it will look more unique. High heels look classic with lehangas and are suited for looking more confident. High heels will add a grace to your walk and will give you chic look when you will walk on-ramp on a way to stage. Selection of fancy but elegant heels will compliment your dress and will throw an everlasting impression on the viewers. If you are looking for mind-blowing designer crop top lehanga collection 2018, here are some images. These will not only inspire you but will also make you realize the amount of hard work these designers have put in bringing the unique designer combinations. 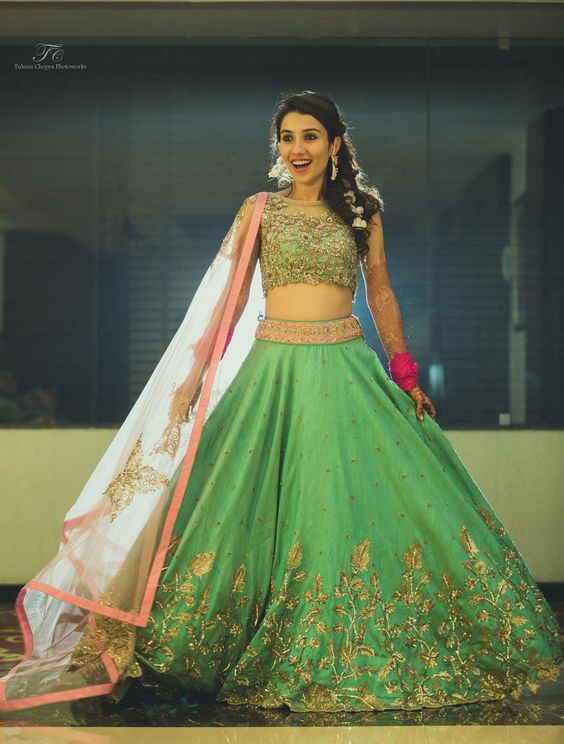 The top bridal crop top lehanga designs 2018 consist of alluring patterns which will make you pay a handsome amount to become a centre of attraction on your wedding day. Enjoy!